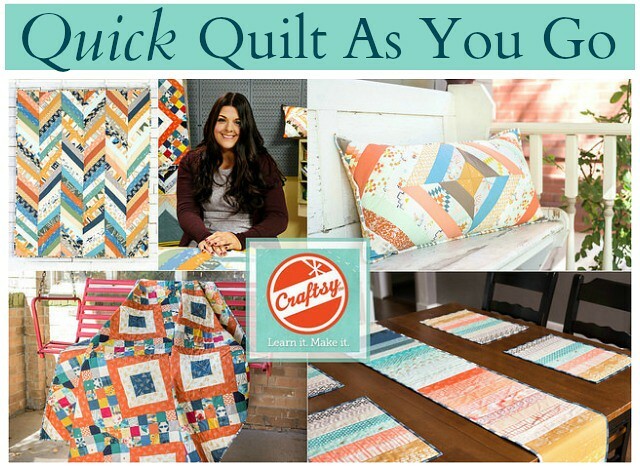 Sign up for my Craftsy Class : Quick Quilt As You Go You can sign up for my Quick Quilt As You Go Craftsy Class for a savings of 50%, that's FIVE patterns for just $19.99 by visiting the sign up page right HERE! 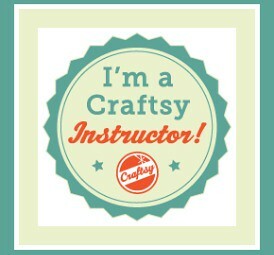 In this class you'll learn the quilt as you go technique I love using so much, all while creating quick placemats, a colorful table runner, a beautiful pillow, and TWO quilts! Be sure to let me know if you sign up, I LOVE interacting with my students!! 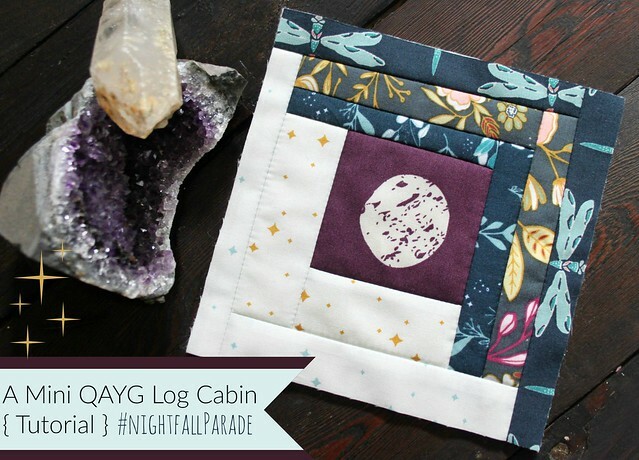 My Mini QAYG Log Cabin tutorial is a Quilt-As-You-Go style quilt block, featuring my Nightfall fabric collection, that you can use to create a beautiful Moon & Stars Floor Pillow! 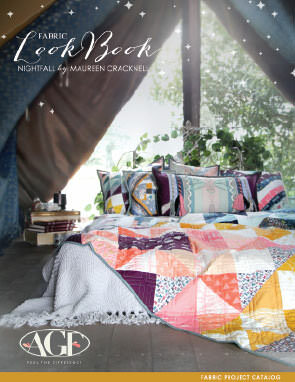 My Summer Janome Artisan quilt tutorial features prints from my new Nightfall collection and the Playground collection by Amy Sinibaldi for Art Gallery Fabrics. 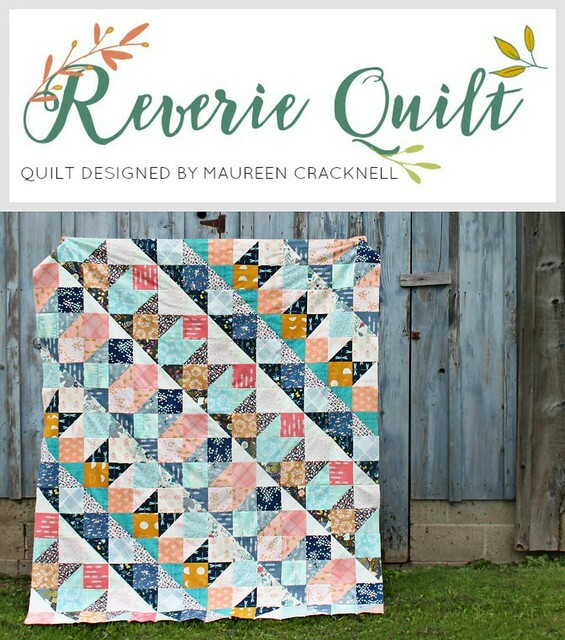 A combination of simple half square triangles and patchwork in these pretty prints reveal a beautiful quilt design, that is fat quarter friendly, and is so fun to make! 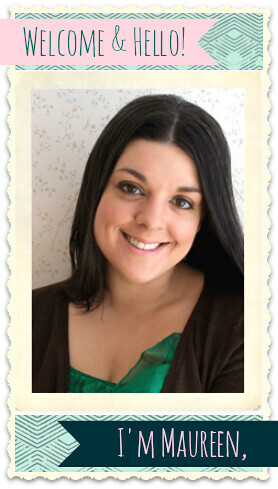 You can find this new tutorial on the Janome Project Center page right HERE! A Diamond Weave Quilt Block Tutorial This quilt block tutorial is from my Diamond Weave Quilt that I created for Janome.com, made using a variety of prints from my Wild & Free and Fleet & Flourish fabric collections. Just by separating red, peach, and coral value prints from ones colored navy, aqua, and blue, a fantastic quilt design is revealed! 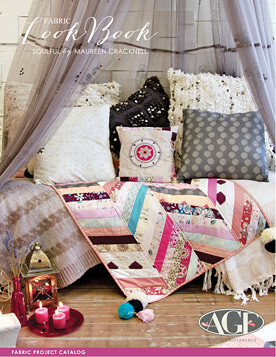 You can find this new tutorial on the Janome Project Center page right HERE! 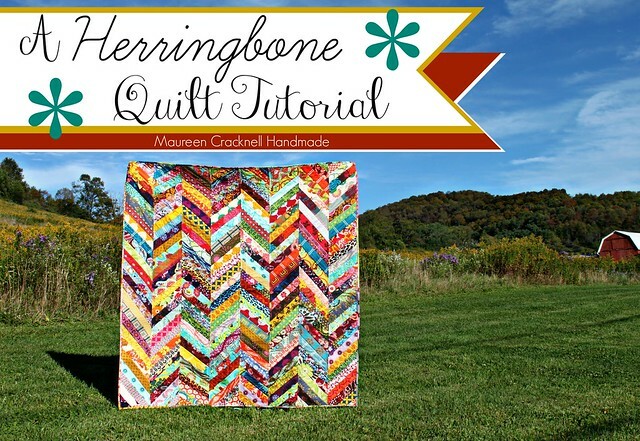 My Herringbone Quilt Tutorial is one of my Quilt-As-You-Go style of quilts, made with long panels rather than traditional "blocks". 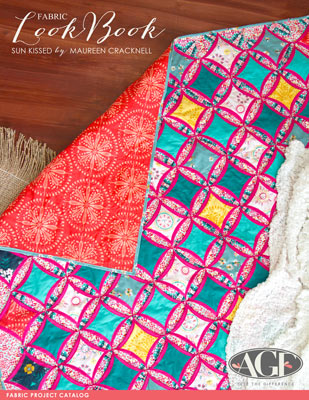 Using cotton batting as the foundation for easy string quilt piecing making this the perfect project for using up those fabric strip scraps or to use a 2.5" pre-cut roll of fabric! 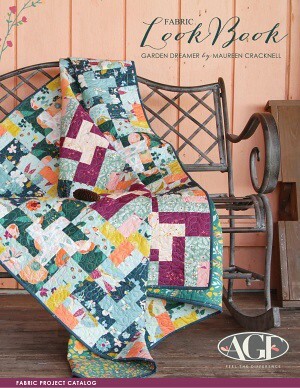 This is definitely one of my most favorite quilt patterns and I'm thrilled to share it with my readers! Be sure to let me know if you give it a go!! A Garden Gate Quilted Patchwork Pillow, this is a project I designed as part of the Pillow Collective blog hop and to share on Janome.com as one of their Independent Designers! 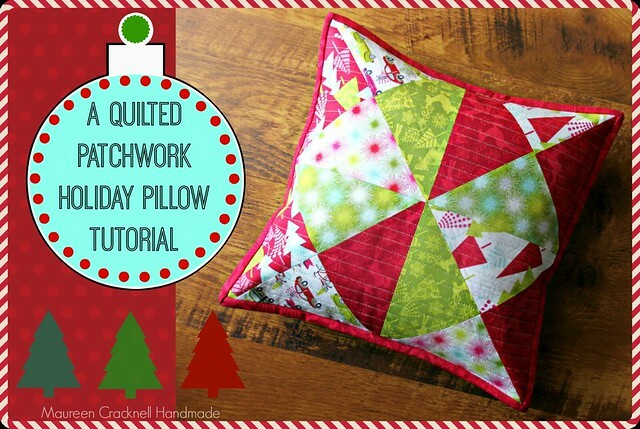 I designed this Hip Holiday Quilted Patchwork Pillow tutorial for ThermoWeb using HeatnBond® Fusible Fleece and Josephine Kimberling’s holiday collection, Hip Holiday for Blend Fabrics. 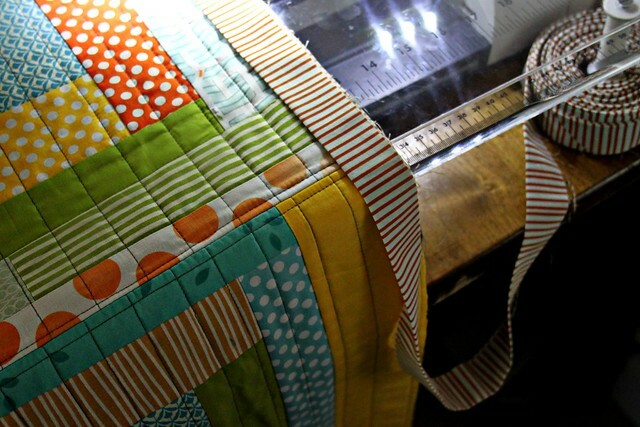 It takes only eight 6″ charm squares to make the pillow front, plus the backing and binding fabrics, and when you finish you’ll have a new, cozy holiday pillow! 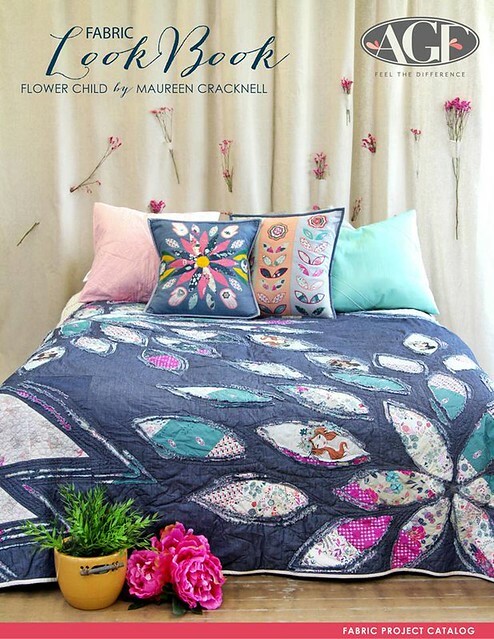 My Soaring High Quilt is a free quilt pattern I created for Cloud9 Fabric's Fall Quilt Market booth using Up, Up & Away, a collection by the amazing Heather Moore of Skinny laMinx! 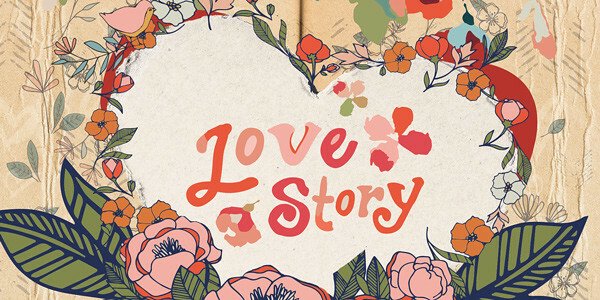 You can find the free downloadable PDF available HERE! 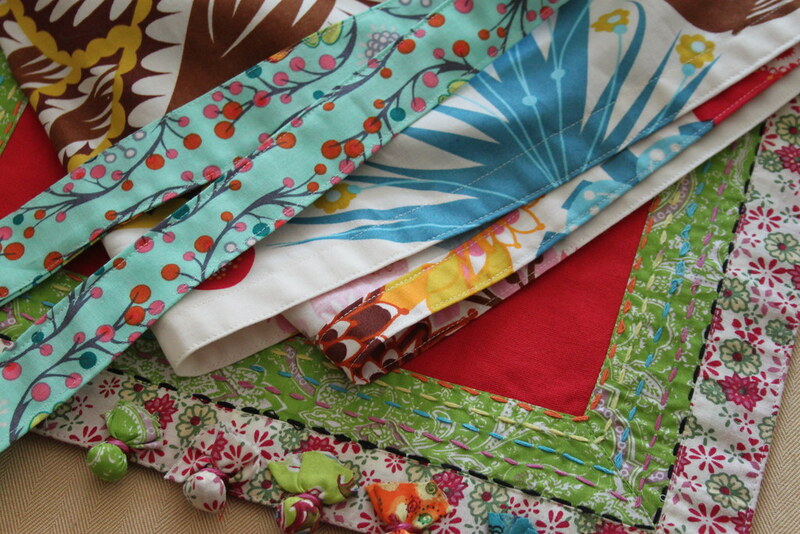 I love making quilt binding and to finish each of my quilts beautifully with ease! Visit this post to read about my preferred methods for quilt binding, and to see my favorite quilt binding tricks in action! 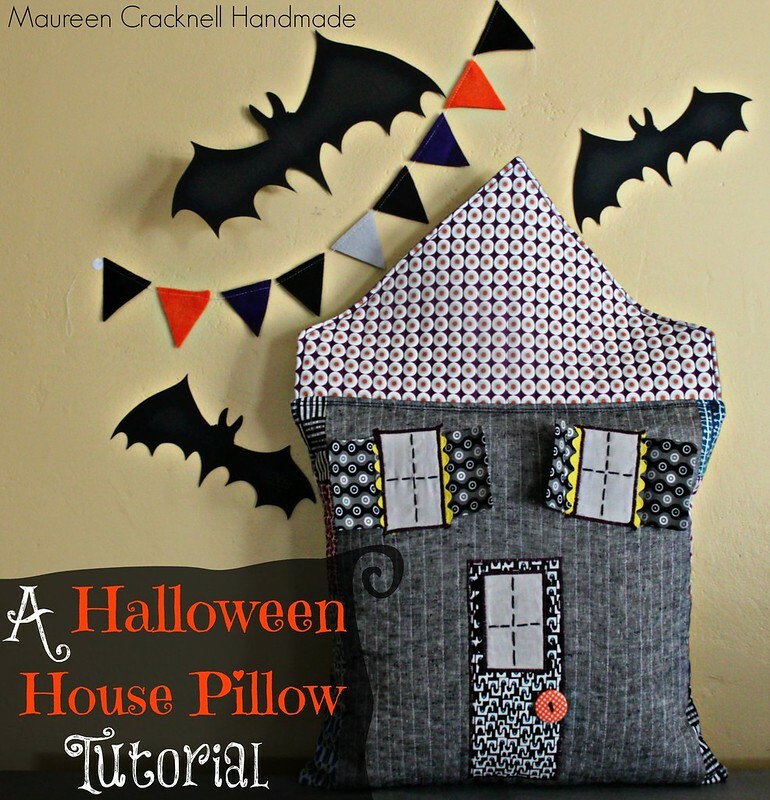 A Halloween House Pillow! This fun pillow was created using MicroMod fabrics, paired with Essex Yarn Dyed Linen in Black, Cloud9's Dem Bones by Sarah Watson, and some solids! I love purple for Halloween just as much as I do orange and black, with those little touches of that golden yellow! 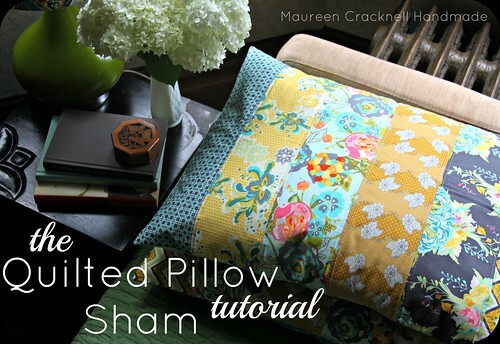 I shared this pillow tutorial right here on the Therm O Web blog! 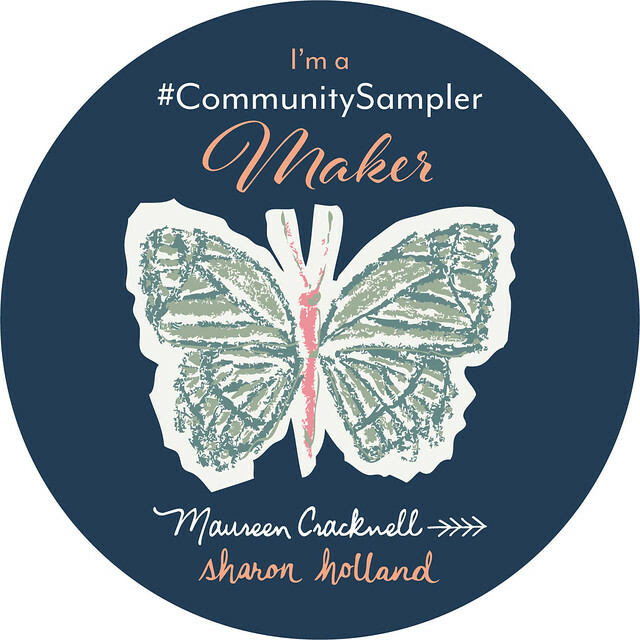 My Stitched Typography Quilt tutorial is a free project I created for the Janome Project Center here, as a Janome Independent Designer. 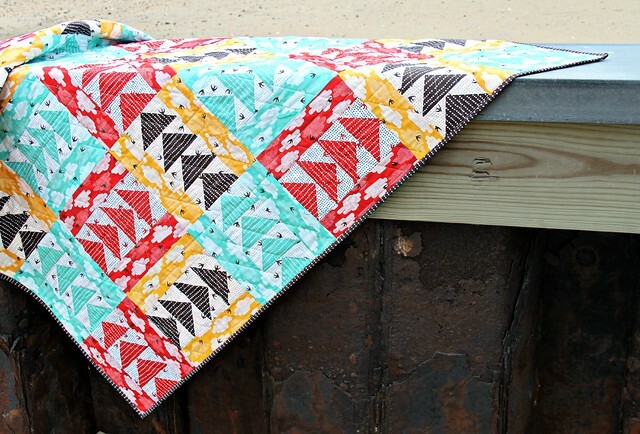 It's a Quilt-As-You-Go style quilt, made with log cabin style blocks, including a simple and fun applique, and stitched typography created using the built-in text stitches in the Horizon Memory Craft sewing machines! 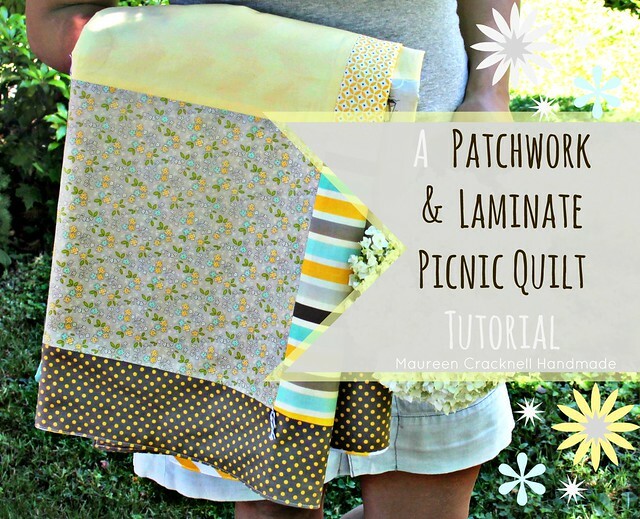 A Patchwork & Laminate Picnic Quilt Tutorial -- As part of the Riley Blake Design Team, I created this tutorial using a simple patchwork of Riley Blake's Seaside Collection for the quilt top and their Yellow Chevron Laminate Fabric for the back. 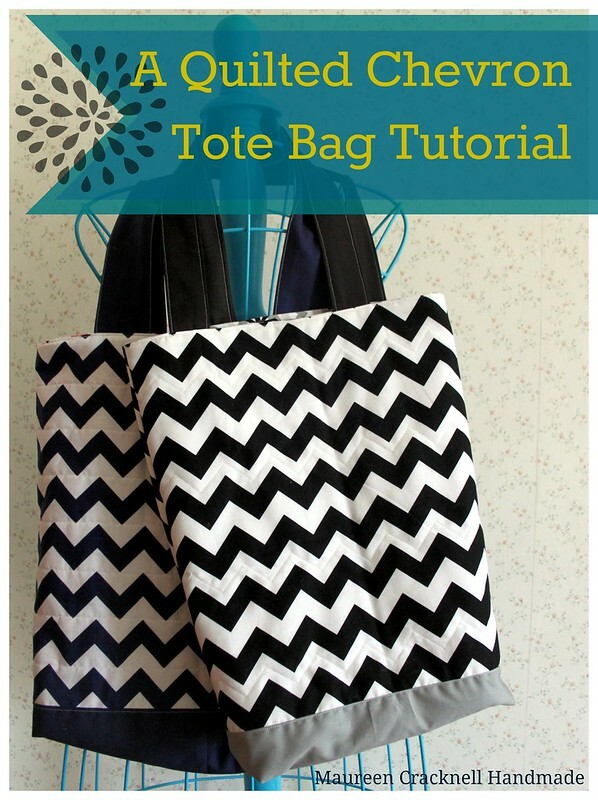 A Quilted Chevron Tote Bag -- A step by step tutorial is for making a Quilted Chevron Tote bag, using very simple instructions and Riley Blake's Chevron fabric collection, that's casual and useful. 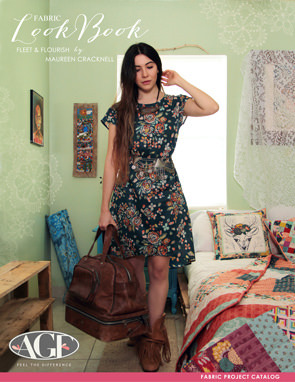 You can take this method of tote bag making and go crazy with your own ideas, just by adding a few steps. 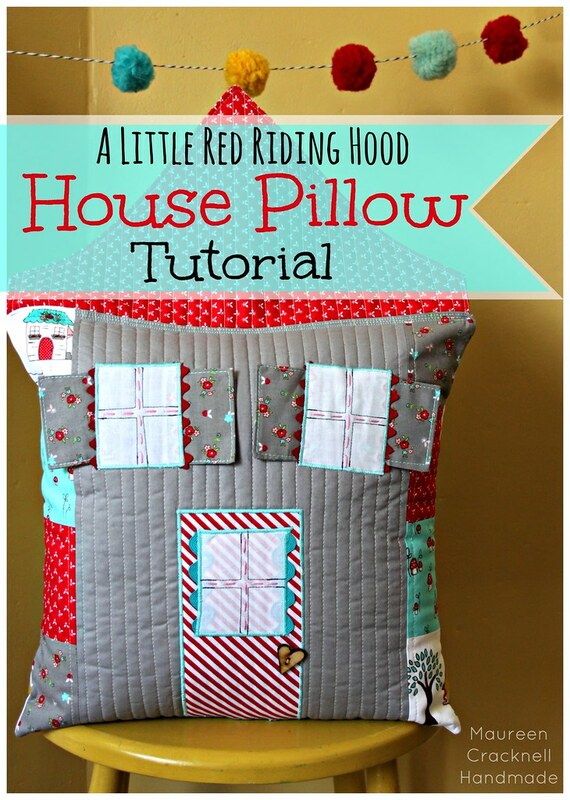 A Quilted Dollhouse Pillow Tutorial -- This project I created as part of the RBD Design Team! Using prints from the Little Red Riding Hood Fabric collection, a couple RBD Basic Solids, using some basic quilting, simple & fun patchwork, raw-edge applique, with a few special embellishments that you can really have some fun with! An Urban Mod Shower Curtain -- A "make it your own" tutorial for an Urban Mod Shower Curtain, using a store-bought white curtain, and giving it an Urban Mod style upgrade with some fun patchwork and raw-edge applique! 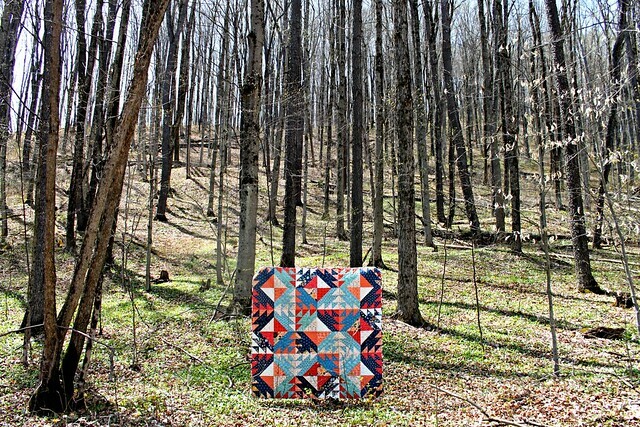 A Forest Collage Quilt Pattern -- I designed this quilt pattern specifically for the Cloud9 Fabrics collection In the Forest. 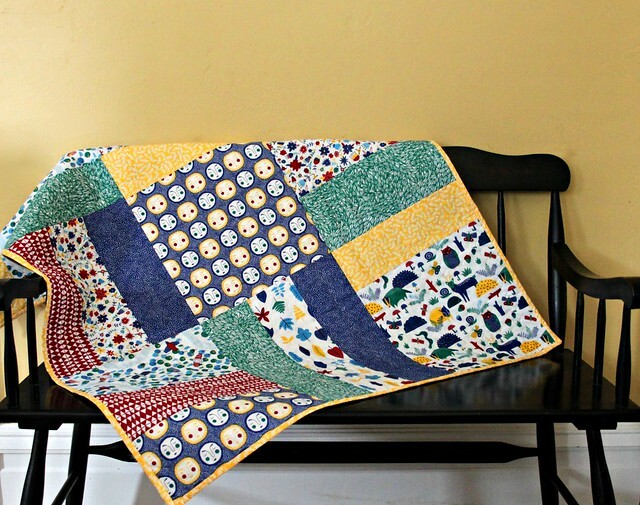 A simple and perfect quilt for children of any age, boy or girl! 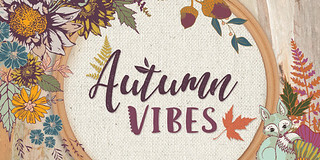 Enjoy this free pattern HERE! 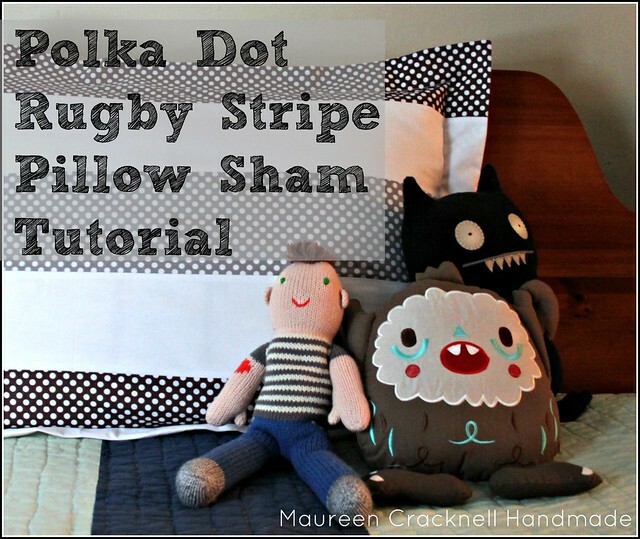 A Polka Dot Rugby Stripe Pillow Sham Tutorial -- A tutorial for a Rugby Stripe Pillow Sham using just a few of Riley Blake's wonderful basics, Cotton Dots and Solid fabric. This pattern creates a high quality pillow sham look, with a wonderful flange border! 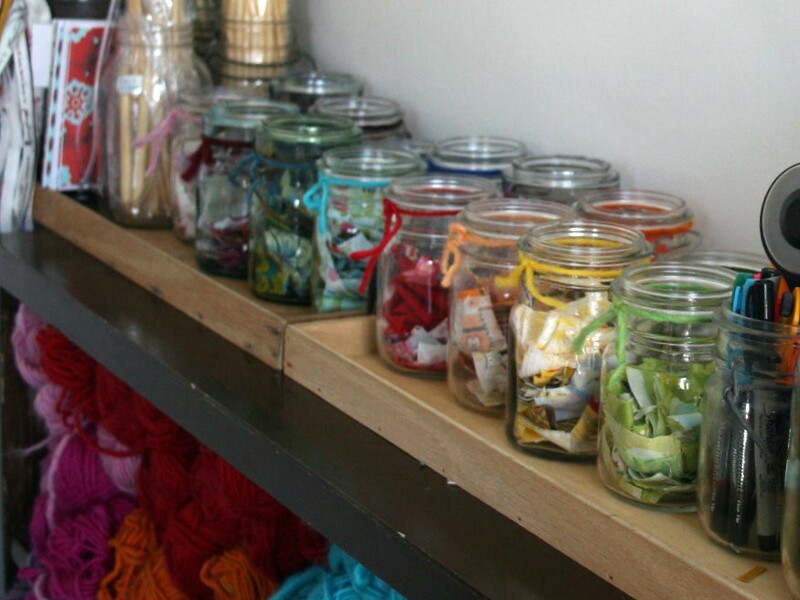 A perfect project for even a beginner sewist! 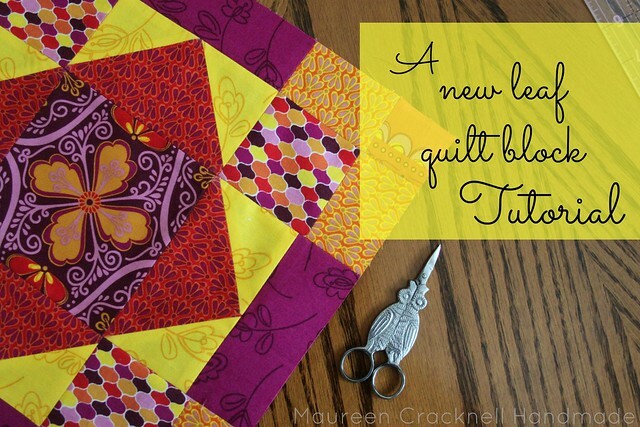 A New Leaf Quilt Block Tutorial -- A tutorial for making a fussy cut quilt block, as part of the New Leaf Bee Block Blog Hop! 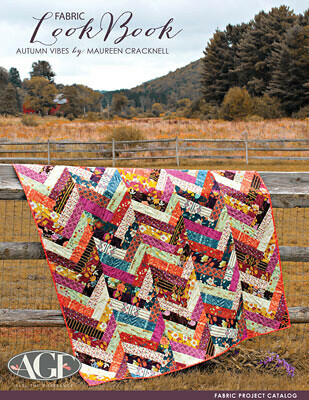 A Chevron Valance Tutorial -- A tutorial to make a chevron pieced valance curtain. 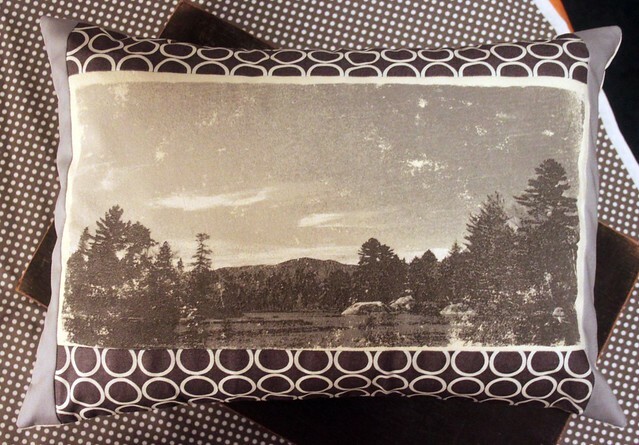 Using just six fat quarters, I was able to make two. 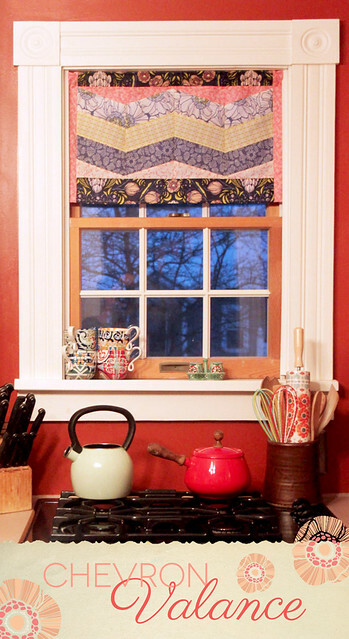 Directions for a 36" valance are also included! A Quilt-As-You-Go Tutorial -- A tutorial with step-by-step instructions for my method of quilting-as-i-go...This is definitely one of my most favorite things to do! A "Seamstress Tea Towel" Tutorail -- My newest tutorial as an Independent Project Designer for Janome, using linen, ticking, applique, and some of those amazing built-in stitches that the Horizon Memory Craft 12000 offers! 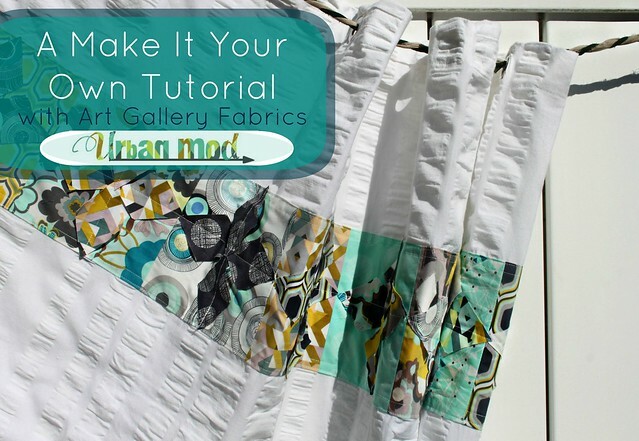 This tutorial includes all the steps needed for making the linen tea towel, as well as a little applique and "I'd rather be sewing!" stitching! 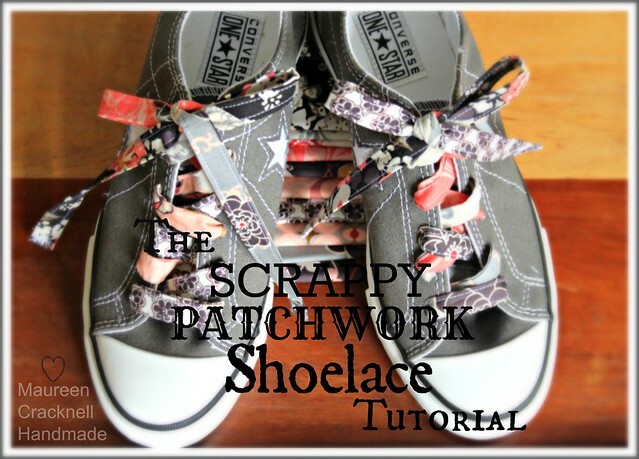 A Scrappy Shoelace Tutorial -- A tutorial showing you how to create fun and funky Scrappy Patchwork Shoelaces! You can find the full project tutorial here! 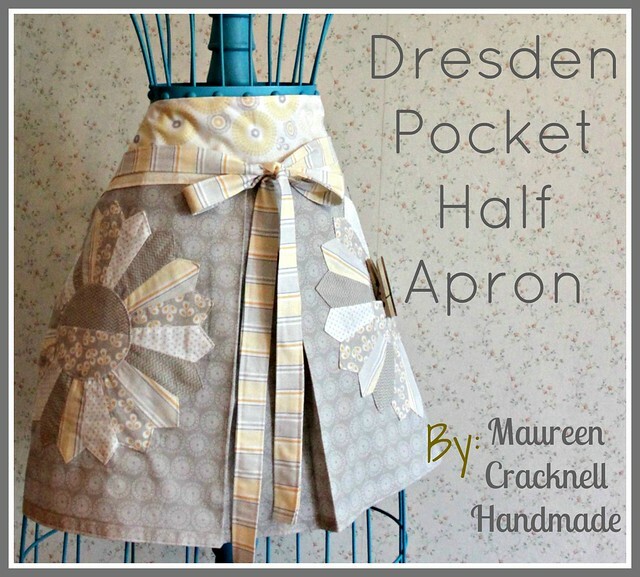 A Dresden Pocket Half Apron -- A tutorial for a new Half Apron Pattern, using the gorgeous Willow fabric collection by My Mind's Eye for Riley Blake Designs! 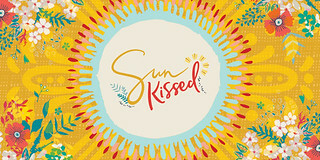 Find this full tutorial on the Riley Blake Blog!! A Simple Drawstring Skirt -- I created this skirt tutorial with a sweet Melody Miller Ruby Star Shining Typewriter Applique, as part of Skirting the Issue for Project Run and Play. It's designed to fit a pre-teen to teenage girl, however, it did fit me just fine, and I'm a size 6 -- the drawstring makes it work for many sizes! 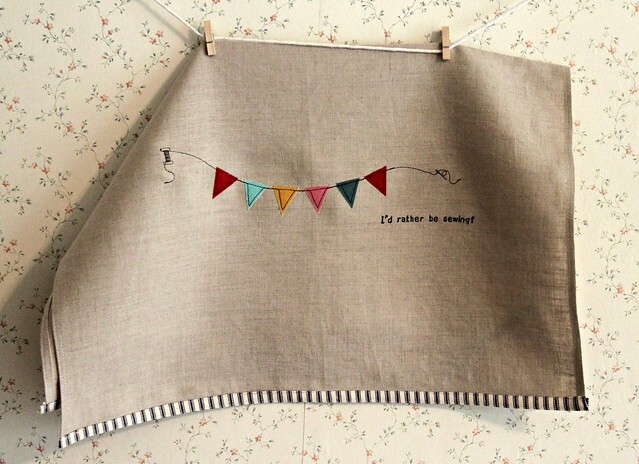 You can make a smaller or larger version using this method, by simply taking away or adding a few inches to the width and length! Poppy Applique Pillow -- This project was completely inspired by those Poppy's out my kitchen window and my love of all things coral, using several of the amazing built-in stitches that my Horizon Memory Craft 12000 offers, and a variety of Aurifil thread, I came up with this simple and fun Poppy Applique pillow design for Janome, as part of their Independent Design Team! 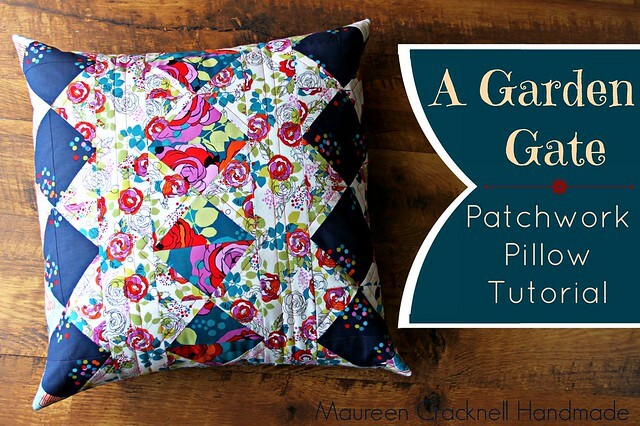 Quilted Pillow Shams -- This tutorial I designed as part of Art Gallery Fabrics Fat quarter Gang, using their gorgeous LillyBelle Fabric Collection, that's quick, easy, and takes only 10 Fat Quarters to make a set! 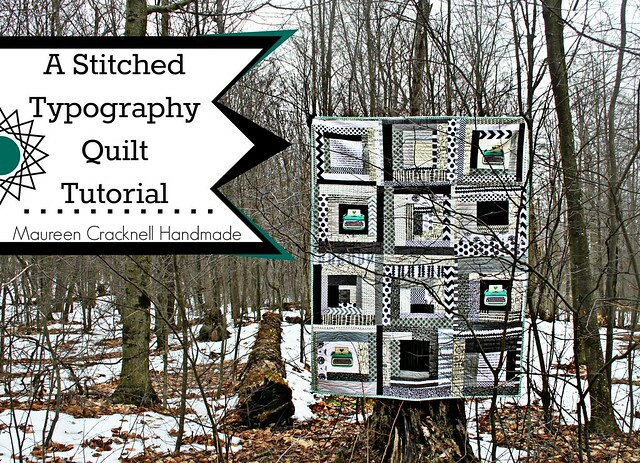 It's a great project for a beginner or if you want a small project to practice sewing those perfect straight quilting lines! 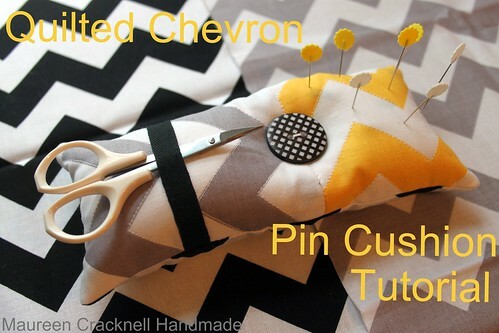 The Quilted Chevron Pin Cushion -- this pin cushion project was created as part of the Riley Blake Design Team, using very simple instructions and Riley Blake's new Chevron fabric collection. 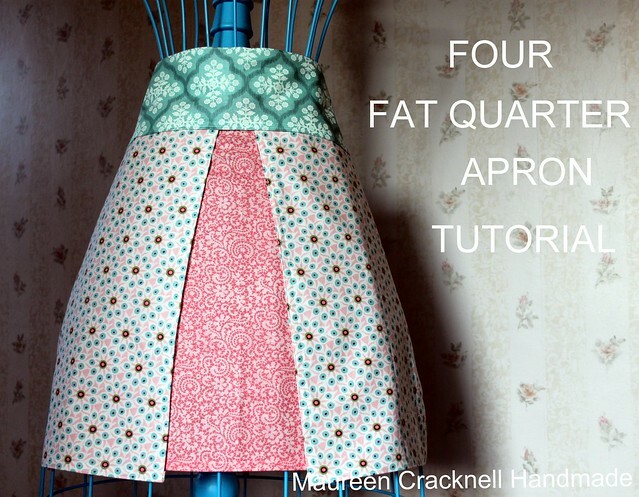 A Four Fat Quarter Apron -- A tutorial for a half apron that sews up quickly and requires less than four fat quarters to make! 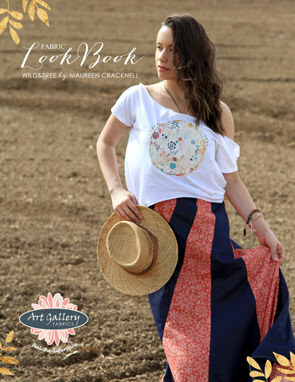 This step by step tutorial creates this basic half apron design, however you can take this simple pattern and add your own details -- applique, pockets, longer straps to wrap around to tie in the front, etc. 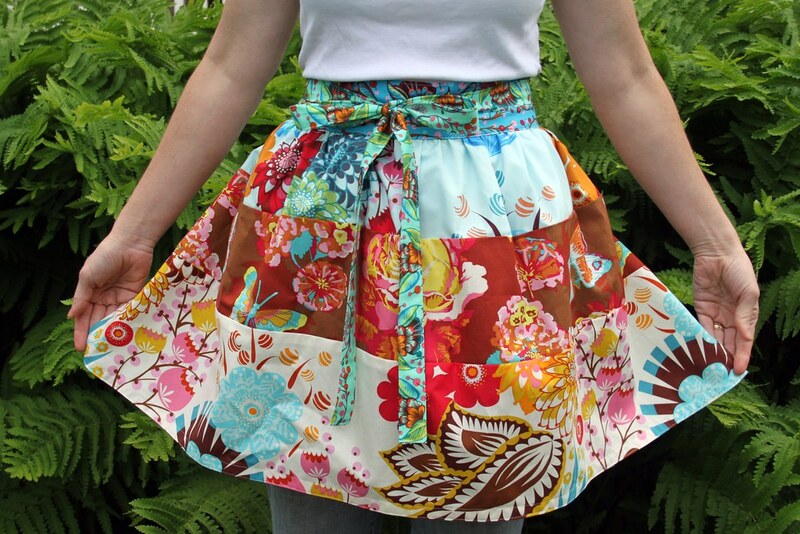 My favorite part is that the bottom skirt fabric stays draped and you can lift the side panels to wipe your hands almost like hanging tea towels! The wide waistband makes this apron easy wearing and flattering to all our shapes, and the angled side panel pieces add a sweet feminine and flirty-ness, too! Enjoy!! 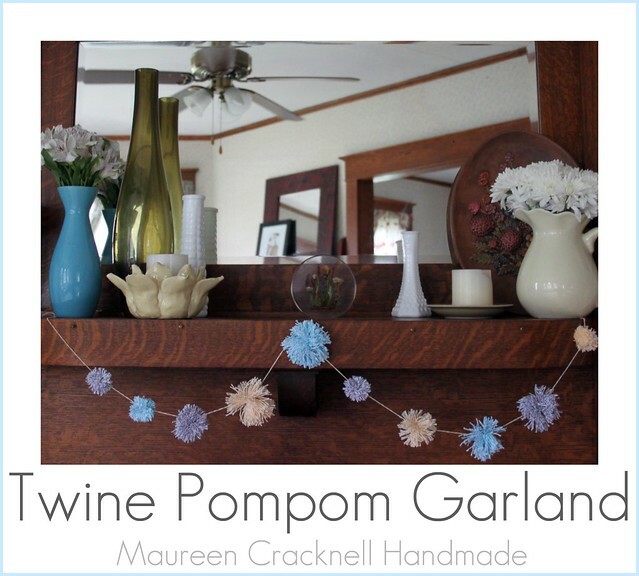 Twine Pom Pom Garland Tutorial -- A pretty garland decoration made from using Whisker Graphics Divine Twine to make a colorful strand of twine pom poms. 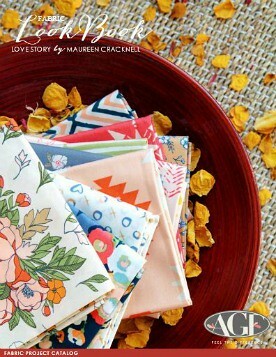 A Fly A Kite Floor Pillow Tutorial -- I am SO excited to be a part of the new Riley Blake Design Team!! 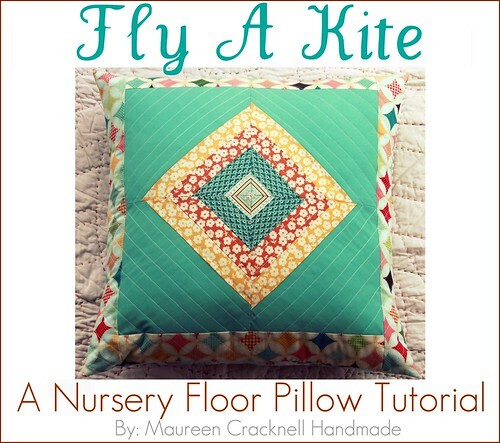 This is a tutorial for a kite themed nursery floor pillow using Riley Blake's new Fly A Kite collection by October Afternoon. This step by step tutorial is for making a large floor pillow, however you can make a smaller version by simply eliminating a few steps. 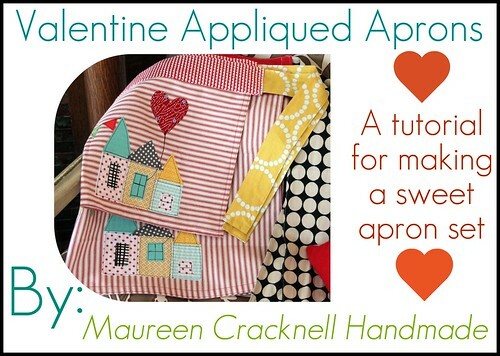 A Valentine Appliqued Apron Set Tutorial -- this tutorial is for a sweet apron set for an adult and child. I use sturdy ticking fabric with simple raw edge applique to add a little Valentine village, that's perfect for wearing all year long. You can use whatever fabrics you'd like with this method of applique to add any details to suit your style or those receiving these aprons. 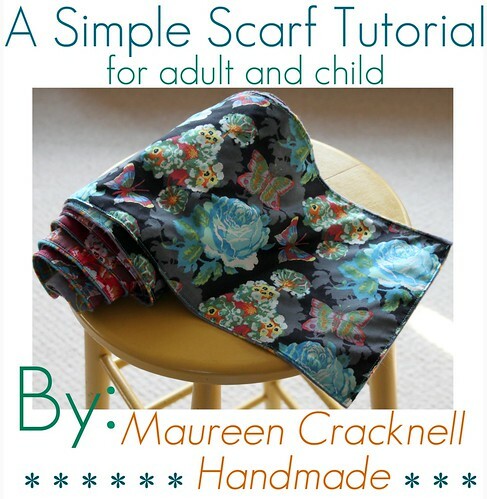 A Simple Scarf Tutorial : : I've added two more size variations for the Simple Children's Scarf Tutorial I shared back in September. 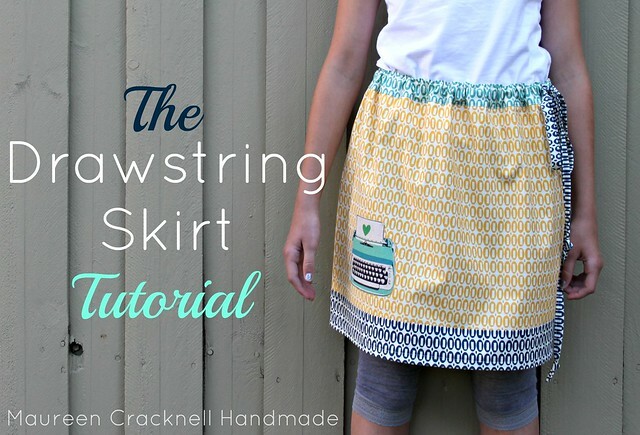 This is a wonderful little tutorial for a beginner sewist. A project that's super quick, easy, and is all about comfort! I'm using photos from our Loulouthi Scarves, where I again used a combination of voile and flannel, to create this updated tutorial. In the end you'll have a lovely, comfortable, two-sided scarf that anyone young or old is sure to love...and actually wear. 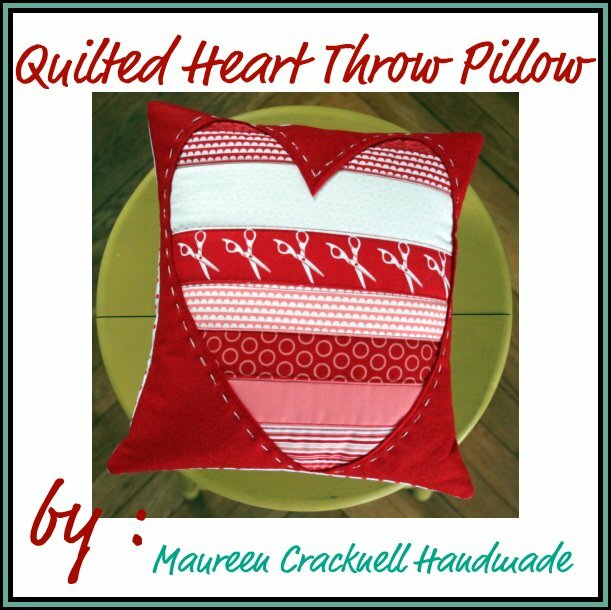 Quilted Heart Throw Pillow : : This tutorial is for a fun and sweet Valentine's Day pillow cover. Using several cuts of my very favorite red and pink fabrics, cherry red wool blend felt, and little hand stitching, I created this pillow for a fast and cute V-day decoration! 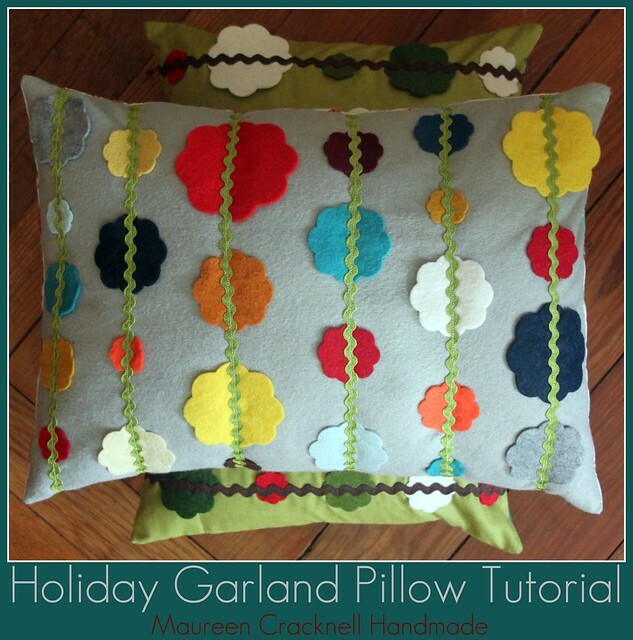 Holiday Garland Pillow : : A tutorial for a simple festive Christmas-y pillow cover. 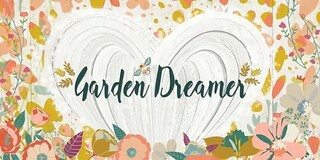 This pillow was completely inspired by my love for garland. Using multicolored cuts of wool blend felt with scalloped edges and colorful ric rac to connect them, I created this pillow thinking it’ll be the perfect decoration to welcome another year of handmade goodness! 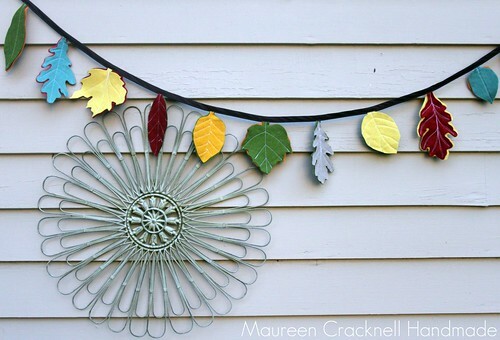 Felt Leaf Garland (updated) : : Fall is the perfect time to get out and get creative by doing nature-inspired art projects with our children. 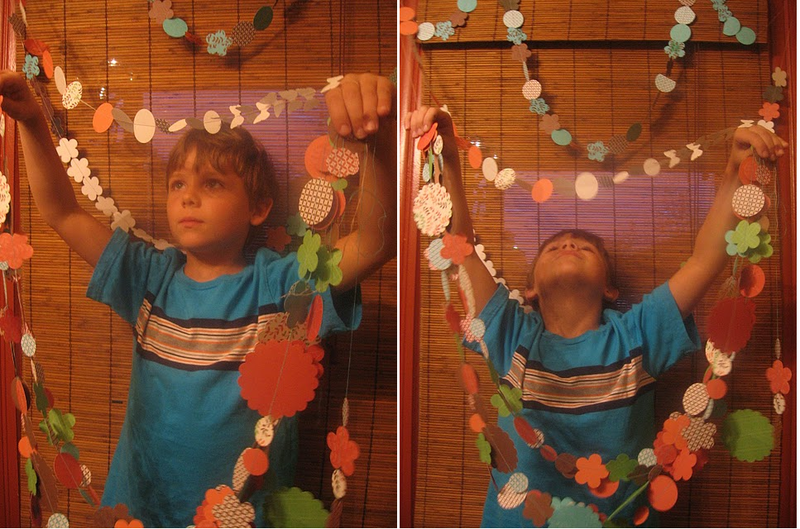 This Felt Leaf Garland project is all about using the natural beauty in the colored leaves of this season to create and inspire an art project for the kids and you to do, together. 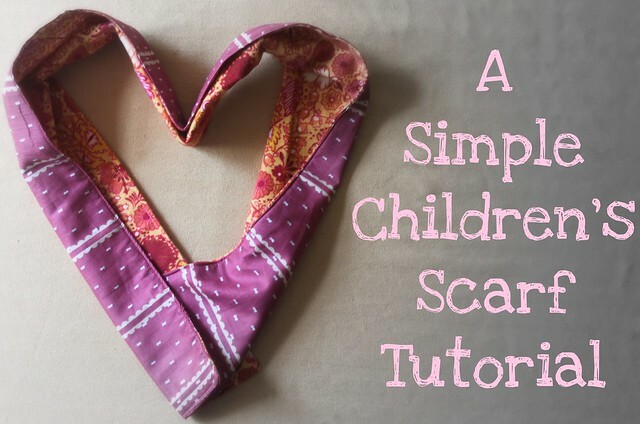 A Simple Children's Scarf Tutorial -- This is a wonderful little tutorial for a beginner sewist. 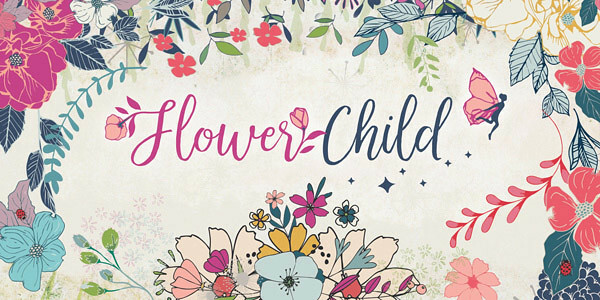 A project that's super quick, easy, and is all about comfort for your child. Quilted Stripes Pillow Tutorial -- My Favorite Colors Stripey Toss Pillow. 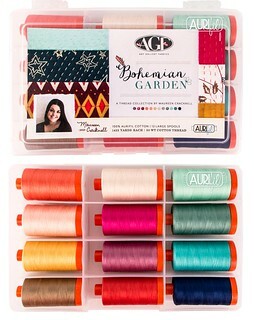 A project designed to showoff your favorite color combinations that's quick, easy, and turns out super cute! 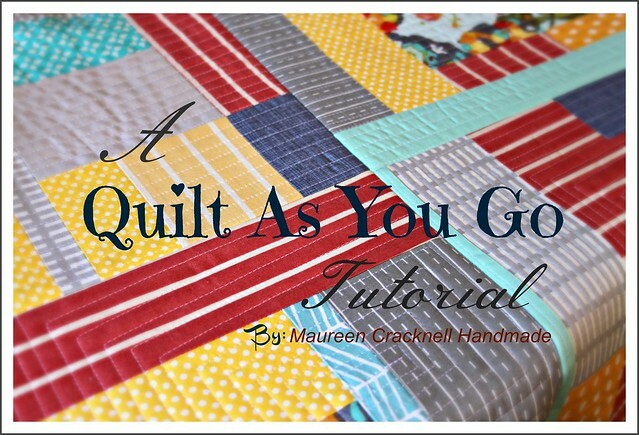 It's a great project for a beginner quilter, if you want a project to practice sewing those perfect straight lines with your machine, and also great if you need to get a little hand quilting practice in. 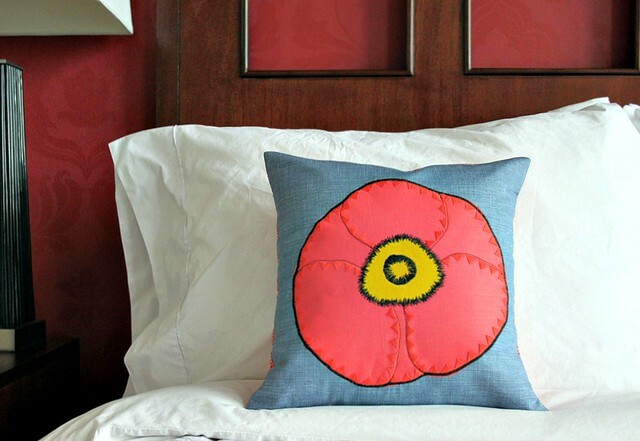 My Favorite T-Shirt Toss Pillow -- an up-cycling tutorial for a simple pillow cover using an old, favorite t-shirt. 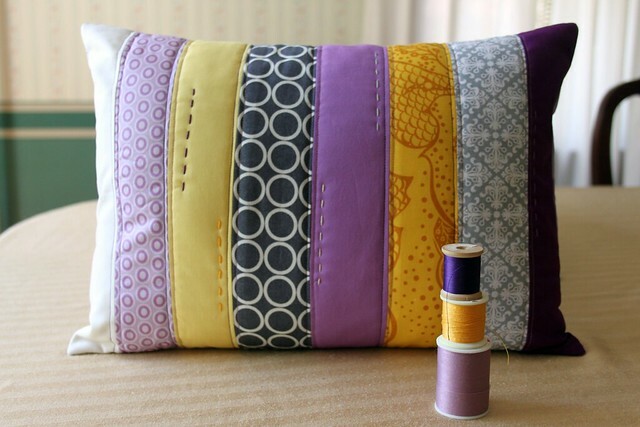 A project designed to save your favorite t-shirt by turning it into a new pillow! Summer Crown Tutorial -- Use the GO! 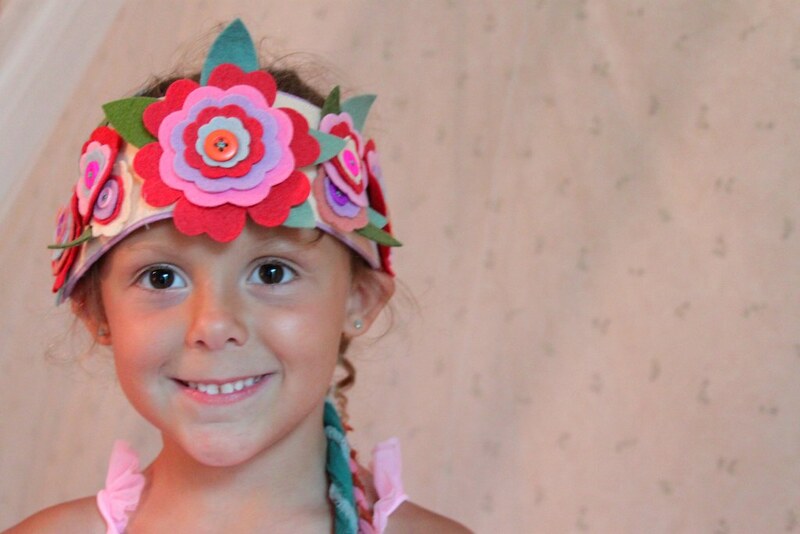 Baby fabric cutter or hand cut felt flowers to make a Felt Flower Summer Crown that's fast, easy, and super cute! 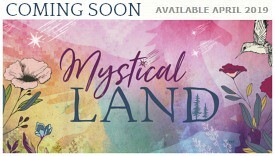 as well as many new ideas and tutorials to share with you. 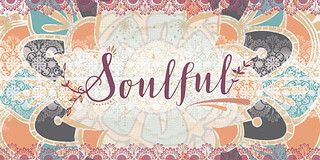 You may sell items made using my tutorials or patterns on a small home scale only. 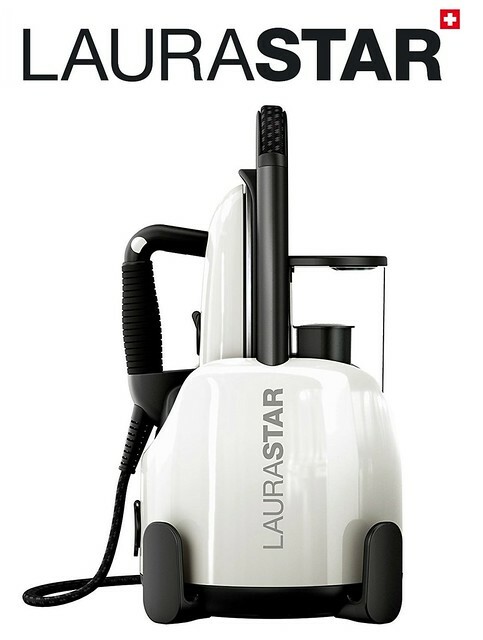 No mass commercial production. 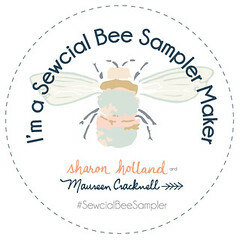 Please credit Maureen Cracknell Handmade anytime a tutorial or pattern of mine is used. 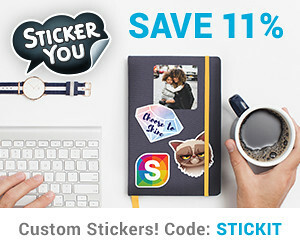 Please do not sell, re-distribute, or offer to teach my tutorials. Feel free to direct people to my blog or link to it.